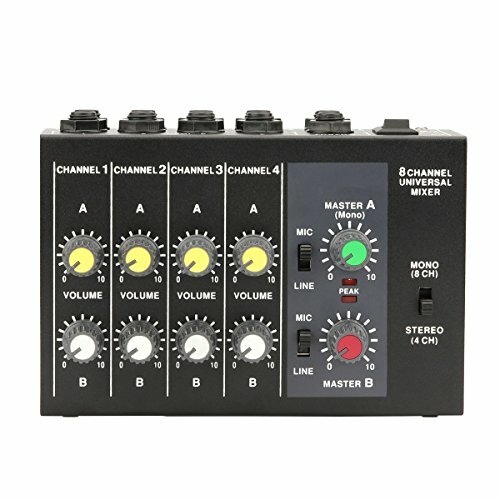 ღAudio mixer with 8 channels input and 2 channels output. ღEach input channel can be adjusted volume individually. ღWith 2 master volume knobs for controlling the output volume. ღSupport MIC or LINE(4ch stereo & 8ch mono) input by adjusting switches. ღCompact size and metal shell, lightweight and durable. ღDual power supply: power adapter(Included) and 9V battery(Not included). Support MIC or LINE(4ch stereo & 8ch mono) input by adjusting switches. Compact size and metal shell, lightweight and durable. If you have any questions about this product by JPOQW, contact us by completing and submitting the form below. If you are looking for a specif part number, please include it with your message.